Frode is both an architect and a pedagog, working with projects for parks, public places, schoolyards and kindergardens in Norway. He has for many years developed tools for involving children and youth in planning processes. He is also well-known for organising inspirational study tours to look at play spaces and school grounds across Europe. In the last two weeks of June 2011 he has two study tours planned for Copenhagen and Berlin. For more information, contact him via his Facebook page or website. These tours are planned to allow participants to attend the International Play Association Conference in Cardiff, July 2011. "Adventure play" is about creating your own frames for play. The construction and building process in itself is worthwhile and creates organisation, cooperation and maximises communication and learning. The product (huts, frames, etc.) can further be used as frames for roleplay, can be quickly torn down, and built up again. 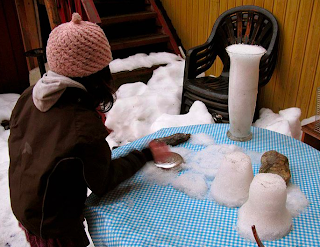 The play potential of a pile of snow! It is "adventure play" when you use materials from the forests or you get tree materials from "building-places" such as adventure playgrounds. When we can use snow in the same way, it is also a kind of "adventure play". 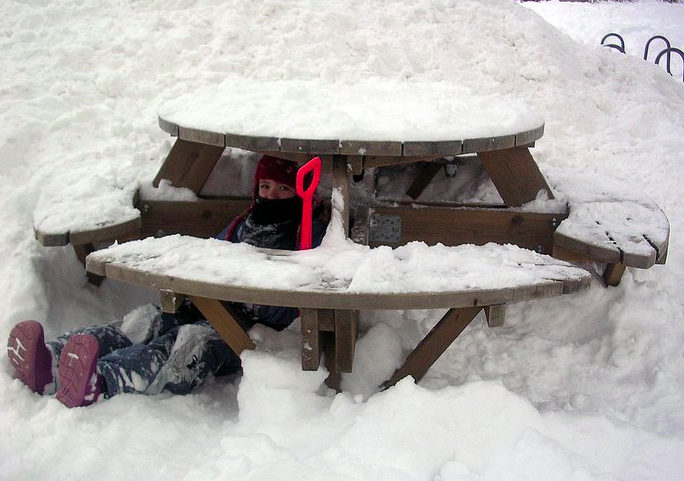 Pile up the snow and let the children play! Each child needs his or her snow hole! 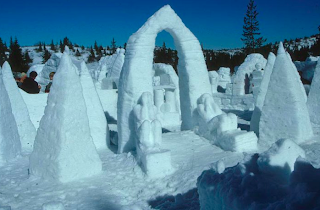 The snow resources in Norway during winter times have always given fabulous possibilities for building and constructing with snow, especially in the far north. 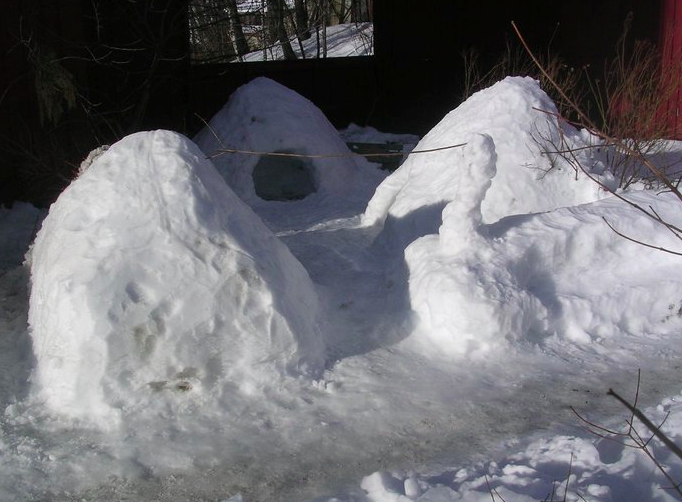 A group of snow dens! What's the collective noun for this? 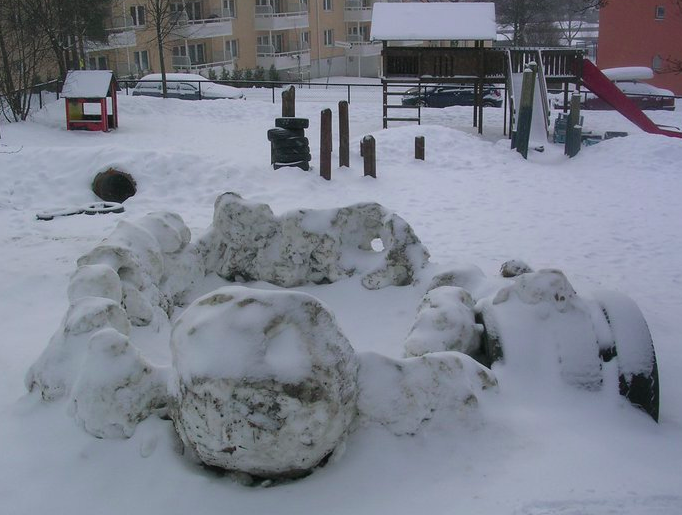 This is one of two main reasons we have not established so many organised adventure playgrounds in Norway. We have nature and wilderness all around us, and we have the snow as the world's best forming material, and also the cheapest one, during winter times. Who says design work doesn't happen outdoors! 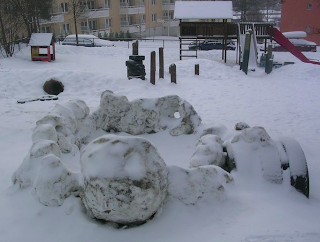 It is understandable that the place we have had an adventure playground established for a longer time in Norway, is in the far south (Haugesund), where we have no snow at all, or very little, during winter times. Snow kitchens! When the mud is frozen, bring out the snow! 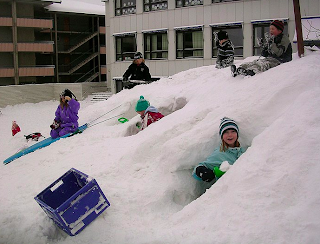 A landscape covered with a thick carpet of snow, is in itself a fabulous "playground" and "play landscape"! 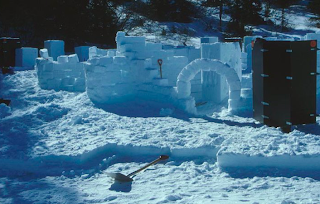 Even adults like to play in the snow and create buildings and structures! We can ask the school janitor to gather all the snow in one practical corner, or a part of the schoolyard. Think carefully about where this should be so that when snow will melt and create waterways, this will not result in a flood or puddle inside a school building! If your school or local authority considers snow holes too risky, then fixed structures may be used by children instead! Then we soon will become a fantastic "snow-hill" and a new topography for snow construction and building snow holes/caves, and a new inspiring landscape for all kind of movements: jumping, gliding/sliding, rolling, making acrobatics!! 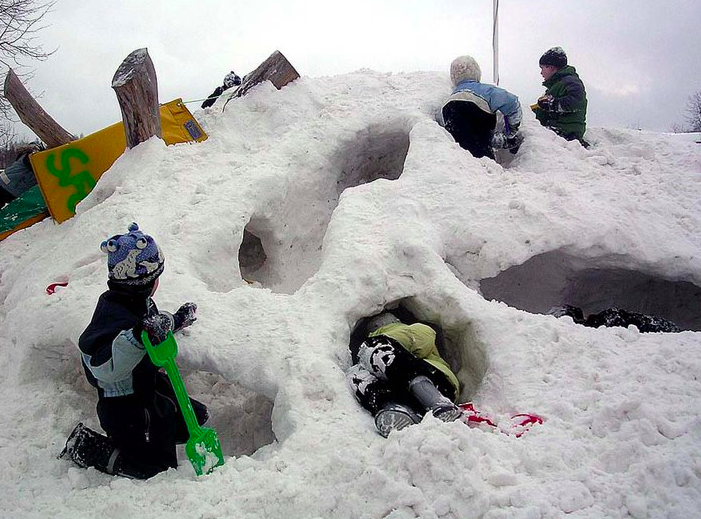 Snow forts are a necessity for cover during a snowball fight! Many thanks to Frode for writing this post and giving permission to use his photos. Text in italics and all photos ©Frode Svane, 2010.